GAINESVILLE, Ga. (Feb. 6, 2017) – Stewart Melvin & Frost managing partner Randall Frost has been named a 2017 Northeast Georgia Business Hall of Fame Laureate by the Junior Achievement organization. Frost was officially honored on Feb. 4 at the Junior Achievement of Northeast Georgia’s annual banquet. The award recognized Frost’s dedication to the entire community and his work to strengthen and connect business and commerce, government and non-profits. His community service includes chairing the Gainesville City Board of Education, Greater Hall Chamber of Commerce, Gainesville Kiwanis Club, Arts Council, Hall County United Way, YMCA Board of Directors, Boys & Girls Club of Hall County, Hall County Humane Society and the Northeastern Bar Association. He is a member of Grace Episcopal Church and a past member of its vestry. He has also served on the advisory boards of the Salvation Army and Regions Bank. Currently he is a member of the Lake Lanier Islands Development Authority. The Hall of Fame induction honors men and women who have strengthened Northeast Georgia’s economy and contributed to its growth. Proceeds from the event benefited Junior Achievement (JA) programs in Northeast Georgia. JA officials said during this academic year more than 8,000 students have participated in its programs led by trained volunteers who teach children financial literacy, business ethics, the fundamentals of free enterprise and the importance of an education. Junior Achievement’s mission is to prepare and inspire young people to succeed in a global economy. Junior Achievement of Northeast Georgia serves 16 counties in the region. 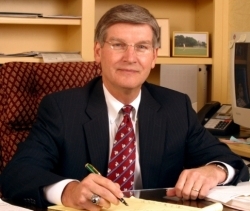 Founded in 1936, Stewart Melvin & Frost is one of Northeast Georgia’s largest and fastest-growing regional law firms. The practice specializes in a broad range of key legal services, including business law, tax and estate planning, municipal bond financing, real estate transactions, litigation, and mediation services. Based in Gainesville, Stewart Melvin & Frost serves a regional client base throughout North Georgia. For more information, visit www.smf-law.com.